Happy New Year from us all at Train Together! We hope you have had a wonderful Christmas. This week we have been reflecting on some of the things that we have accomplished in 2015 and why we think 2016 will be even better. We hope you enjoy our New Year Newsletter! Firstly, we would like to say a huge thank you to all of our members. As a Train Together team we have collectively raised an impressive £743.11 for some amazing charities, including the Royal Lancaster Infirmary Children’s Ward and Macmillan Cancer Care. 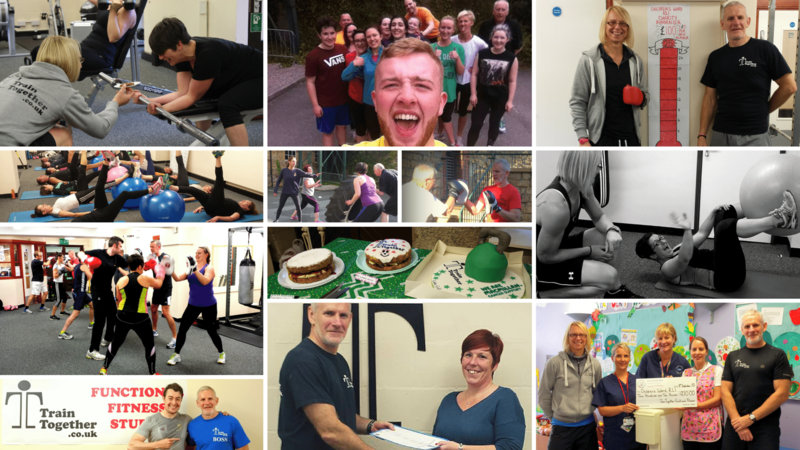 We would like to personally thank you for all you did to help us help others – from baking cakes for our coffee morning to inviting your friends to enjoy a free week at our gym – we couldn’t have done it without you! We are now planning the next big event, so if you have any ideas to help us raise more money we would love to hear from you. Throughout the year, we have had the pleasure to train some fantastic international athletes including Duathlon Team GB member Louise Goddard, England Lacrosse player John Beadle and World Cup Champion Speed Skier Jan Farrell. We aim to do a charity sporting event (hopefully with the support of our athletes) and maybe even a Summer BBQ – because any excuse will do! Secondly, we welcomed some great Personal Trainers to the staff team this year – including the energetic Joe Norcross and Chris Liley. Both (I’m sure you’ll agree) have added some fun (and burpees) to the gym! In addition, our very own Julie Evison went from avid gym-goer to Level 3 Personal Trainer. Julie trained with us to learn the ropes and is now taking regular Boot Camps, classes and 1-2-1 clients. We will be running many more courses this coming year, so if you enjoy keeping fit and want to learn a new skill, a qualification in fitness instructing could be right up your street! If you’ve been with us all year, you will have noticed a few new additions to the time table. We have seen 285 brand new faces this year come along to enjoy a free week of gym and classes on us. We added extra classes to pad out our busier evenings and give you all the chance to take part in what you fancy without compromising our small classes and 1-2-1 training. In 2016 we will be introducing spinning classes – so if you are a keen cyclist or just want to shift some pounds, spinning will be the perfect accompaniment to your workout regime. Alongside our usual classes, including Yoga, Weight Lifting, Zumba, Boxercise and Circuits, we will also see the start of a new Strength and Conditioning session with Olympic rings – kicking off with a free taster session on Monday 18th January at 8pm. Finally, our members have seen some amazing results throughout the year. We have a whiteboard filled with Personal Bests in our gym and it gives us great pleasure updating it when members continually reach their goals. If you are yet to set a New Year’s Resolution, we challenge you to smash last year’s PBs. If you’re yet to join the board, come along to the gym and give it a go! We have everything from cycling and rowing challenges to 1 Rep Max for Squat, Bench Press and Dead Lift. Not forgetting, a huge well done to our Members of the Year for 2015 – Jess Walker and Patrick De Salvo! Keep up the hard work! We hope you have a fantastic 2016, whatever it may bring and if you’ve never been to Train Together, we hope this will be the year you’ll come along and join the team.